We all know about light. It travels through a vacuum at the speed we call c. But light is just one type of radiation that can be used to study the universe. We speak of the entire range of electric and magnetic waves flying through space called the electromagnetic spectrum. Sing the song! radio microwaves infrared visible light ultraviolet x rays gamma rays Stars give off energy from radio all the way up to gamma rays. We can now study the universe with the entire electromagnetic spectrum. We are somewhat limited at the surface of Earth, however. Not all types of radiation reach the surface. When we look at the universe at these different wavelengths, things look a lot different. 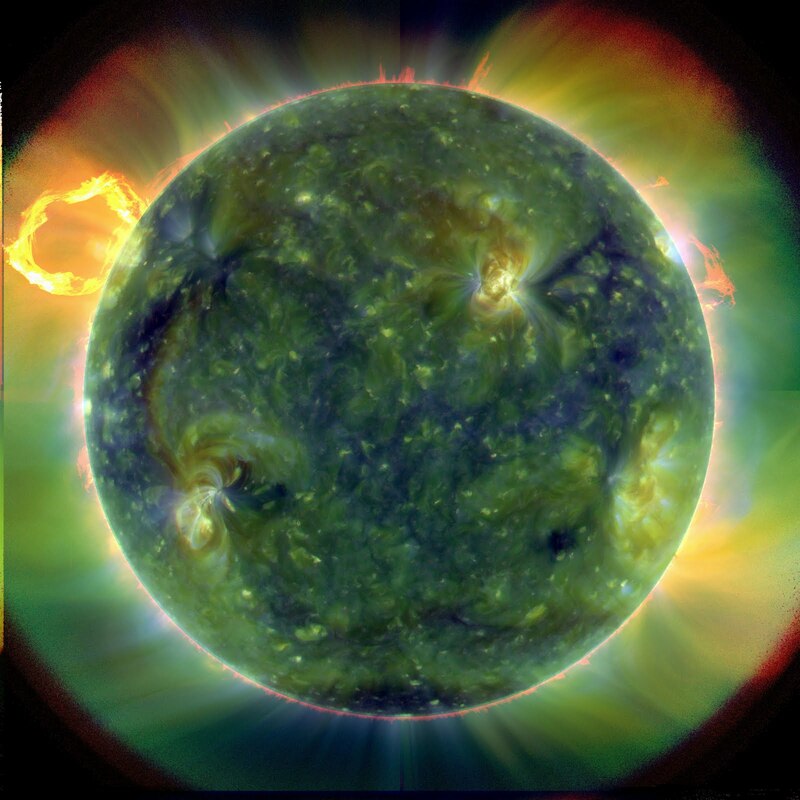 The Sun takes on an entirely different look when we observe it a x ray wavelengths. Some earthly creatures can also see the world at different wavelengths. Would you like to see like a bee? Click here for a diagram similar to the one on the first test. Radio We have artificially produced radio waves for over one hundred years now, but the universe was filled with radio emissions long before that. Astronomers have been able to make useful observations at radio wavelengths for only 70 years or so. Since radio waves are long in wavelength, our radio telescopes must also be huge. Microwaves We are familiar with microwaves because we use them to heat our food. But microwave astronomical observations will reveal relatively cool objects in the universe, such as interstellar dust. Infrared We sense infrared as heat. Infrared has a wavelength slightly longer than visible light. Some predators, such as snakes, are able to locate their prey by the infrared radiation they emit. Visible Visible is what we see, of course. Humans have also come to divide visible light into what we call colors. You are perhaps familiar with Roy G. Biv. Ultraviolet U.V. radiation has a slightly smaller wavelength than visible light and therefor, slightly more energy. That extra energy can damage skins cells. Fortunately, Earth’s ozone layer saves us. X Rays With short wavelengths and high energies, X Rays can do a lot of damage. They are generated in this universe by objects that have temperatures of millions of degrees. Gamma Rays Gamma rays are the most energetic of all electromagnetic radiation. They are generated by the massive explosions called supernovae. In recent decades, we have been puzzled by short bursts of gamma rays in the sky.